Eastern Wyoming College, in conjunction with the Goshen County School District, is sponsoring, for the seventh consecutive year, “Adelante Ninos-Onward…Upward…to Higher Education.” This program, scheduled for Thursday, May 13, 2010, 9:00 a.m. -1:30 p.m., Torrington, Wyoming, seeks to increase the expectation of elementary-aged children for college enrollment and to familiarize these students with college life. The conference-funded by the EWC Board of Trustees with additional assistance received from the Wyoming Department of Health-Children’s Special Health, and Region VIII BUENO Equity Assistance Center-has consistently grown over the last five years and has expanded district-wide with an expected attendance rate of over 275, including participants across the state of Wyoming and Nebraska. The program presents a model of how institutions of higher education can coordinate with local school districts and instill higher educational goals in our younger-aged children. The conference features a dual track of academic stations designed for children and an educational track designed for parents on becoming effective partners in their child’s academic success. Program activities for participating elementary students will include visits to designed academic stations on campus which illustrate the avenue of study and potential career areas available to those individuals who obtain a college degree. While the emphasis of the program will be the exposure to a serious academic environment, the program itself will combine enjoyable activities for 5th grade level students with the adventure of a field trip to a different place. Designed academic stations feature the following topics: (1) “Building Bridges: Adventures in Engineering,” presented by Lindy Johnson, Professional Engineer, UW College of Engineering and Applied Science, Laramie, Wyoming; (2) “Wild Kingdom: Adventures in Animal Science,” presented by EWC Veterinary Technology Instructor Dr. Ed Bittner, Torrington, Wyoming; (3) “Celebrating Literature: Capturing the Joy of Reading,” presented by Scottsbluff Middle School Teacher-Librarian Carla Vanderford and Reading Teacher Jennifer Mertz-Hand, Scottsbluff, Nebraska; (4) “It’s Great to be Bilingüe! (Bilingual) ” presented by GCSD staff Jenny Delgado and Pamela Garcia, Torrington, Wyoming; (5) “Fantasy and the World of Make-Believe,” presented by EWC Library Staff Marilyn Miller, Becky Lorenz, and Casey Debus; (6) “Baila el Mambo” (Dance the Mambo), presented by professional dance instructor Kathy Tabor of the Tabor Dance Academy, Scottsbluff, Nebraska; (7) “The Magic of Choosing Your Future,” presented by Dr. Earl Reum, Denver, Colorado; (8) “Discovering Science,” presented by Amy Tilson, Front Range Community College, Denver, Colorado. The conference parent educational track features some of the following topics: 1) “The Power of Parents Equals Educational Success for Students,” presented by Dr. Maria Guajardo, Executive Director of the Mayor’s Office for Education and Youth, Denver, Colorado; 2) “Ready to Read: Fun Ways to Equip Our Children with Early Literacy Skills,” presented by Irene Romsa, Bi-Lingual and Multi-Cultural Children’s Outreach Coordinator, Poudre Libraries, Fort Collins, Colorado; 3) “Stop the Money Leak-Ensuring the Financial Means and Exploring Financial Options to Meet the Costs of Higher Education for Your Child,” presented by Molly Williams, Director, EWC Office of Financial Aid; 4) “College Prep Time Line,” presented by Dr. Dolores Cardona, Associate Dean of Students, University of Wyoming, Laramie, Wyoming; 5) “Early Warning Signs of Alcohol and Drug Use Among Adolescents: Steps Parents Can Take,” presented by Jim Jenson, L.P.C., Program Director, WMCI Alcohol and Drug Residential Treatment Program, Torrington, Wyoming; 6) “Speaking Diversely: The Value of Maintaining the Spanish Language;” presented by Dr. Maura Velasquez-Castillo; 7) “Cancer Awareness-Prevention, Screening, Resource Services, Including Cancer Statistics of Southeast Wyoming,” presented by Barb Lawyer, R.N., Program Manager, Wyoming Cancer Resource Services. The conference is open to the public and features a free luncheon with cultural entertainment provided by “Mariachi de las Artes” of the Denver School of the Arts, Denver, Colorado. The Mariachi ensemble is sponsored in part by the Wyoming Arts Council. The First General Session begins at 9:00 a.m., EWC Fine Arts Auditorium, Torrington, WY. On-site registration is scheduled for 8:15 a.m. – 9:00 a.m.
A featured exhibit of the conference will include a colorful mural entitled “Paredes Hablando” (Walls that Speak) depicting the history, stories, culture, and family/community life of area Hispanics. Steven Lucero, well-known Denver muralist, was commissioned by La Radio Montanessa of Laramie, Wyoming, to create the mural which will be on exhibit for the first-time statewide, during the length of the conference, in the EWC Library Hallway. The public is invited to attend a financial aid information night, Monday, May 3rd from 4 to 7 p.m. in the Tebbet Building, at EWC. Anyone considering or attending any post-secondary institution can learn more about scholarships and financial aid programs, complete the Free Application for Federal Student Aid (FAFSA) online, and receive help understanding and comparing college costs and financial aid awards they have been offered. “We believe this busy time of year is an important time to provide help to graduating high school seniors, their families, and others considering or going to college this fall, and making their enrollment and financial aid decisions,” says Molly Williams, Director of Financial Aid at EWC. The event is sponsored by the financial aid office at EWC and TRIO program’s Educational Opportunity Center in Cheyenne. For more information, call the EWC financial aid office at 307.532.8224 or 1.866.327.8996, or EOC at 307.638.1958. Eastern Wyoming College will present the Spring 2010 Music Concert on Thursday, April 29, at 7:00 pm in the EWC Fine Arts Auditorium. This concert is free and open to the public. The EWC Collegiate Chorale is directed by Aaron Bahmer and the EWC Community Choir is directed by Virginia Davis and will feature soloists, percussion and a guest clarinetist. Both choirs will feature Janet Howard as the accompanist. For more information, please contact EWC Community Education at 307.532.8213 or 307.532.8323. “Serving and then being reappointed by the Governor to such an important board is surely an honor. To help provide decent, affordable housing to Wyomingites is a rewarding experience, and I sincerely appreciate this opportunity,” shared Deahl about his appointment. The WCDA Board of Directors establishes the direction and oversees policy for the organization. As Wyoming’s housing finance agency, the WCDA is an instrumentality of the state, but does not receive any state funding. The WCDA finances affordable housing in Wyoming by making loans for first-time homebuyers and by the administration of federal resources for affordable rental housing. For more information, visit the WCDA website at www.wyomingcda.com. Eastern Wyoming College English and Spanish instructor John Nesbitt has recently won two 2010 Western Writers of America Spur Awards. Western Writers of America is a nationwide organization, and its annual competitions are open to anyone who has published work in the preceding year. The Divisions of Arts, Humanities, Social and Behavioral Sciences is sponsoring a reception to honor Nesbitt. The reception will be held on Friday, April 30th from 12:30 pm to 2:00 pm in the Fine Arts Lobby at Eastern Wyoming College. This event is free and open to the public. Eastern Wyoming College students and an instructor were among 300 college students and professionals competing in the National conference of American Criminal Justice Association held in March at Portland, Oregon. Those in attendance were Taylor Allbright of Wheatland, WY, Ariel Gass of Valentine, NE, Ricci Pacheco , Brad Muhlenkamp, and Timmy Van Litsenborgh all three of Torrington, WY and instructor Larry Curtis. Competition began with academic testing consisting of Corrections, Criminal Law, Police management, Juvenile Justice and ACJA history. It was followed by crime scene investigation competition. Also included were Firearms Skills Proficiency and Shooting. Brad Muhlenkamp placed third in the community college division for Police Management. The three person team of Taylor Allbright, Ricci Pacheco and Larry Curtis placed third in the professional division of Crime Scene Investigation. “The conference gave the students an opportunity to showcase their talents and compete against others from all parts of the country. Their enthusiasm, camaraderie, knowledge and skill made them a very competitive team.” Curtis said. Eastern Wyoming College is pleased to announce that fourteen students were initiated into the Phi Theta Kappa Honor Society on February 25, 2010. Students initiated into the Alpha Omicron Lambda Chapter of PTK include: Beth Allan of Torrington, WY, Alysha Brown of Wheatland, WY, Kayla Durham of Wellington, Co, Valerie Ford of Lusk, WY, Debra Hafer of Kilgore, NE, Tina Jepson of Torrington, WY, Michael Jones of Great Falls, MT, Jessica Koenig of Longmont, Co, Lee Myers III of Torrington, WY, Leah Nelson of Richland, MT, Chelsi Polzin of Stanford, MT, Christopher Short , Ashley Wood, and Seth Vannier all three from Torrington, WY. The Keynote Speaker for the event was Janan McCreery, Education Instructor at EWC. Phi Theta Kappa’s mission is to recognize and encourage the academic achievement of two-year college students and provide opportunitiesfor individual growth and development through participation in honors, leadership, service, and fellowship programs. Eastern Wyoming College students will now use the Federal Direct Loan program for all federal student loans. “The most important message for students to hear is that there will still be student loans and there are many benefits available to them,” shared EWC Financial Aid Director Molly Williams. EWC will participate in the Federal Direct Loan (subsidized and unsubsidized student loans), and Federal Parent PLUS Direct Loan programs. Through this program, students borrow from the federal government through their college and private lenders are eliminated. The first step to apply for a Federal Direct Loan is to complete a Free Application for Federal Student Aid (FAFSA), www.fafsa.ed.gov. The second step is to contact the financial aid office at the college in which you plan to attend. Private student loans are available through a number of lenders. Please contact the EWC Financial Aid Office for a list of these lenders and for information about applying for private student loans. If you have any questions, please contact the financial aid office at the College at 307.532.8325 or visit the website atewc.wy.edu/future/finaid/index.cfm. 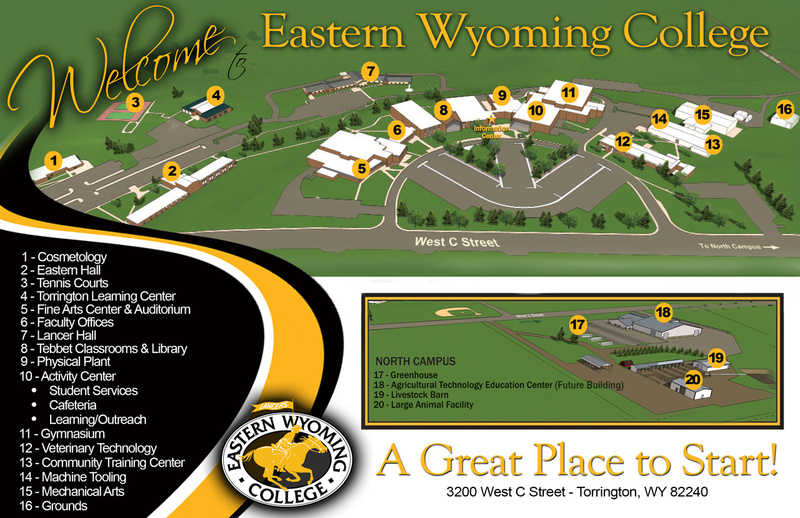 Eastern Wyoming College will be hosting a Job Expo on Friday, April 16, 2010. There will be over 15 employers, based both locally and from across the region participating, providing a variety of job opportunities for both EWC students and community members. The Job Expo will begin at 9 am in the hallways of the Tebbet building at the College, and will continue until 2 pm. Employers may conduct interviews throughout the day. Job opportunities range from seasonal, to part-time, to full-time in a variety of fields. Representatives participating include: AEP, Alliance Railcar Facility, Banner Health, Cloud Peak Energy, Community Education Center, Department of Workforce Services, Goshen County Sheriff’s Department, Panhandle Coop Association, St. Joseph’s Children’s Home, TIC – The Industrial Company, University of Wyoming Outreach, USDA/Natural Resources Conservation Service, Westech WOTCO, Western Mine Services, Wyoming Army National Guard and Wyoming Medium Correctional Institution. Anyone looking for work is encouraged to bring a resume and visit with employers at this free job expo. If you are an employer looking for help, it is not too late to sign up to participate. Please call Karen Posten at 307.532.8214 or email her atkaren.posten@ewc.wy.edu for more information. And the Spur Award goes to…John Nesbitt. For the second year in the row, Nesbitt has been honored by the Western Writers of America (WWA) for his western writings. He will be recognized and receive the coveted Spur Award at the WWA Convention, June 22-26 in Knoxville, Tennessee. According to the WWA website, the Spur Awards are given annually for distinguished writing about the American West and are among the oldest and most prestigious awards in American literature. The awards were established in 1953. Winners of the Spur Awards in previous years include Larry McMurtry for Lonesome Dove and Michael Blake for Dances With Wolves. Each year, judges pick one winner and two finalists in each category. In 2008, Nesbitt was a finalist for the award with his novel Raven Springs and won in 2009 for his novel Trouble at the Redstone. This year Nesbitt is being honored and recognized for two works of western literature. His novel, Stranger in Thunder Basin, won the Spur Award for Best Mass-Market Paperback Original. He is also receiving a Spur Award for his short story titled “At the End of the Orchard,” which was originally published by Hardboiled Magazine. This short story takes place in a peach orchard and labor camp in California in 1964 and is part of another line of fiction that Nesbitt is working on. Nesbitt’s most recent novel was released in February of 2010 and is entitled Not a Rustler. This is a ranch story about a person being accused of rustling cattle when he didn’t do it. The character courageously rises up to defend himself and clear his name. Recently, Mysterical-E, an electronic magazine, published a novella by Nesbitt. The story, Dead for the Last Time, began in one edition and was concluded in another. Winning awards such as the Spur awards has also provided opportunities for Nesbitt’s work to be featured in other formats. He has had novels go into large print, electronic books and audio books. He will have another novel released in October of 2010. Nesbitt is currently an English and Spanish instructor at Eastern Wyoming College in Torrington, Wyoming. He has taught at the College for 29 years.